Nottingham Green Festival is now in its 27th year and is organised by grass roots community based volunteers, not-for-profit and with no statutory funding. 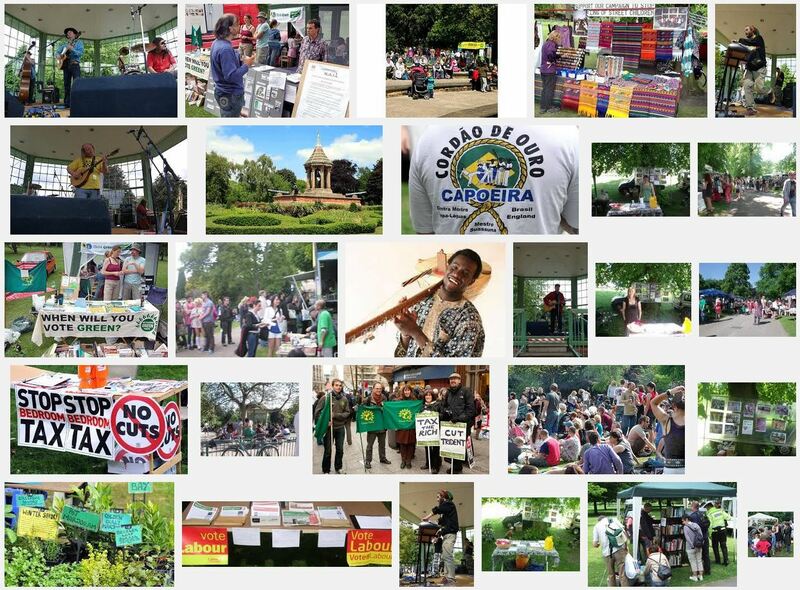 The ethical standards and sustainability / environmental / human / animal rights ethos of the FREE one day event are long established, having evolved from the pre-history of Nottingham Peace Festival from which it grew. At the last event, we estimate we had around 5,000 adults and children in attendance. We are proud to run the event ‘off-grid’. Two stages of free live music are powered by solar panels and battery storage equipment. Outdoor entertainment and adult & children’s activities and workshops include stalls from small green businesses, craft workers, community groups, charities, campaigns, artisan food producers and vegan caterers. Sustainable and energy-saving technologies, transport and information are promoted. We encourage food vendors and stalls to operate with minimal or no plastic. In the recent report by the UN Intergovernmental Panel on Climate Change (IPCC), the world’s leading climate scientists have warned there are only a dozen years for global warming to be kept to a maximum of 1.5C, beyond which even half a degree will significantly worsen the risks of drought, floods, extreme heat and poverty for hundreds of millions of people. The tipping points beyond which we will be unable to regulate the situation are just around the corner. It is with this in mind that the organisers of the Green Festival feel that we need to step up a gear and include education, workshops, information sharing and action to better enable people to understand the issues of concern and to help them and their neighbourhoods bring about the changes required. Respected medical journal, The Lancet, stated that “Civilisation is in crisis; we can no longer feed our population a healthy diet while balancing planetary resources. If we can eat in a way that works for our planet as well as our bodies, the natural balance will be restored.” This has been challenged by other scientists but there is an argument that a massive reduction in meat consumption supporting a move away from livestock farming could be part of the solution to our planetary dilemmas. The Green Festival has addressed these issues since the 1980’s, with exclusively vegetarian food, including Veggies Catering Campaign, since day one. With the growing interest and adoption of vegan living, supported in Nottingham by initiatives such as Sneinton Vegan Market, the Green Festival is taking a lead nationally with an all-vegan food policy. Alongside this, other sustainable issues are advanced by the event, especially regarding single use packaging and plastics. The free tea stall & some caterers use returnable mugs, plastic water bottles are banned in favour of the free water fountain at the Arboretum, funded by the Green Festival. This year stall holders have formed a sustainability working group to share best practice to reduce their impact. We are aware that personal and community learning and changing are best achieved in a happy positive environment, not by being immobilised by threats of doom. The joyous and relaxed atmosphere of the Green Festival is a perfect event to help people accept serious lifestyle change and look to working within their friendship circles to promote these necessary changes. We attract a wide spread of local people of all ages, and plan further efforts to make the site safer for people with disabilities, despite the increasing crowds. We make provision to serve the many local communities but must always work to improve the event. We organise and prepare for the event throughout the year. Beyond the local and community groups currently involved, in future we hope to include staff, students and societies from our universities and colleges in projects to help educate and inform those attending the event about the urgency of our situation, and offering positive and practical actions that individuals and communities can take. The events runs with a £1500 deficit in the £6000+ budget and has no statutory funding. Click button above to donate with PayPal or credit/debit cards (see link at bottom of the Paypal page). See other options on the Fundraising page. The Arboretum, Waverley Street / Addison Street, NG7 4HF, one minute from the High School Tram Stop and a few minutes from Nottingham’s Old Market Square or the Forest Tram Stop & Park & Ride. Many NCT buses pass the entance off Mansfield Road – ask for the Huntingdon Street Stop. Cyclists met at noon at the Square to join a mini Critical Mass Bike Ride to the Green Fest! In 2018 there were over 120 local small green businesses, craft producers, food producers and voluntary/campaign groups – see the …Full Directory here.. with early booked stalls shown on this Live Map. APPLICATIONS FOR 2019 may open in the Spring [See stall booking information here – subject to revision by sustainability working group]. To help with the 2019 event please join us at a planning group meeting, usually on the 2nd Sunday of each month at 4pm at the Sumac Centre – but check. Everyone that supports the event – stall holders, caterers, campaign groups, performers, volunteers & everyone attending – all are invited to share feedback & ideas via Facebook, Twitter or email to help the planning of the 2019 event. Distribute publicity materials available from the Sumac Centre, Crocus Cafe, Five Leaves Bookshop, Green Emporium on Haydn Road and at Veggies Catering Campaign events. Your support will make all the difference in ensuring the success of Nottingham’s own Green Festival, the place for the whole family to learn, explore and try the latest in everything environmentally friendly and ethical, whilst also having lots of fun in the beautiful setting of the Arboretum Park.